At March in San Francisco, kitchen and entertaining products mix with art, such as cake paintings by Gary Komarin. Linens from Society Limonata hang in the shop. March is a purveyor of modern kitchen essentials. Behind a simple facade on Sacramento Street, March showcases a mixture of sturdy, well-designed tabletop items and kitchen supplies. Among the store's wares is the Fantasia black flatware set. Owner Sam Hamilton hand selects favorites for the inventory. March’s Pantry collection contains jams and spices. The store also carries Christiane Perrochon’s Blue Violet ceramics. 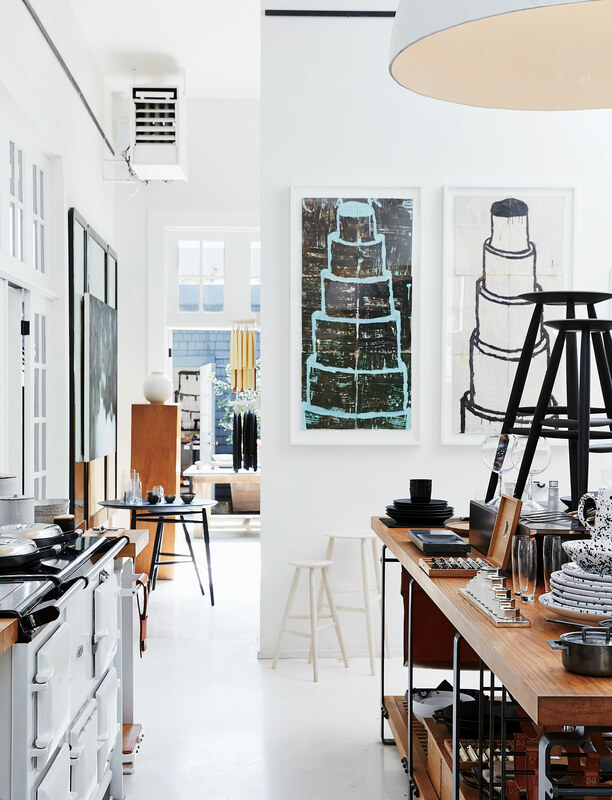 This sunny store in San Francisco, run by Sam Hamilton, is the city’s go-to spot for top-notch kitchen supplies. How has March evolved since it opened? The store first opened in 2003, focusing exclusively on European antique and contemporary furniture and products for the home. Today, March features items for the kitchen, pantry, and entertaining. Collections include our Parsons and work tables, pottery from Victoria Morris and Christiane Perrochon, leather accents and decorative accessories from Michaël Verheyden, and the March Pantry label, which includes jams, vinegar, and spices. We also exhibit a changing roster of artists who work in a number of different media. Art commissioned for the store includes Gary Komarin cake paintings, oil still lifes of cuts of meat by Carrie Mae Smith, Josh Vogel wood sculptures, Jonathan Kline baskets, and still-life photographs by Paulette Tavormina. What is March’s design philosophy? I am inspired by the idea of showcasing exquisite everyday objects. I love pieces that communicate a historical resonance. Today, so many utilitarian items have a built-in obsolescence. The timelessness of an object has everything to do with design, materials, and craftsmanship. Whether it’s a piece from Maison Jansen or something as seemingly pedestrian as a kitchen canister or mixing bowl, our customers look to us for heritable pieces. What makes a great table? Tabletop accessories that enhance the food one is serving. For everyday, I love Wedgwood White bone china, as it’s the perfect color of soft white. Sterling silverware is lovely for special occasions, but I’ve been mixing it up a bit with brass, copper, or black flatware. I’m a fan of introducing an unusual color or pattern for a dessert plate or bowl. I love a hearty Belgian linen napkin—preferably a 26-inch square. Also, lovely flowers and candles—not too high, so guests can see one another across the table. Which gift can you never go wrong buying for someone? Christiane Perrochon tabletop, Henry Dean hurricanes or a Blackcreek oxidized oak butcher block. Which gift items sell best during the holidays? Michaël Verheyden’s Concrete Vase has been a huge favorite. What are people buying from you right now, and what are some of your favorite designs in the store? The jams, chutneys and almond butter have been selling really well. I love the olive oil and vinegar—they’re clean and delicious—and the wild bitter-orange jam. I also favor the wooden spoons that are exclusive to us from Blackcreek Mercantile & Trading Co. and the white-speckled kitchen canisters by Victoria Morris Pottery. Society Limonta linens, made by one of the oldest textile manufacturers in Europe, are also favorites of mine.